Revue scientifique de formation continue et de développement professionnel de la SFAR. Anesthésie & Réanimation est disponible aux formats papier et électronique et est inclus dans votre adhésion à la SFAR. Anesthésie & Réanimation suit les Recommendations for the Conduct, Reporting, Editing, and Publication of Scholarly Work in Medical Journals de l’International Committee of Medical Journal Editors (ICMJE Recommendations). La revue adhère également aux règles élaborées par le Committee on Publication Ethics (COPE, voir COPE’s guidelines) et aux recommandations de la Haute Autorité de Santé (HAS). Elle est par ailleurs indexée dans les bases Scopus et Embase. 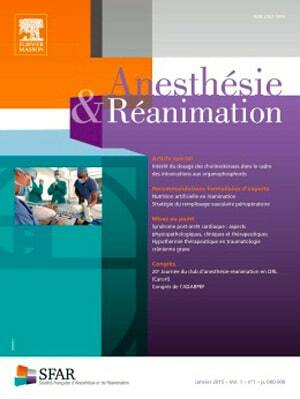 (Formerly Annales Françaises d’Anesthésie et de Réanimation) publishes in English the highest quality original material, both scientific and clinical, on all aspects of Anaesthesia, Critical Care & Pain Medicine. Issues contain (guest) Editorials, Original articles, Reviews, Special articles, Letters to the Editor, Technical notes, Short communications. Original works include clinical or laboratory investigations and clinical or equipment reports. Reviews include narrative reviews, systematic reviews and meta-analyses. 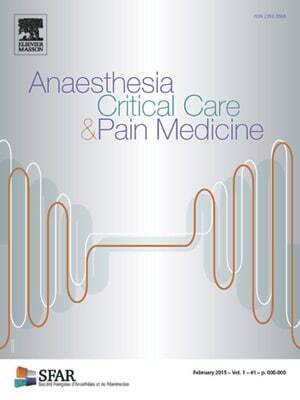 Official academic journal of the French Society of Anaesthesia and Intensive Care (SFAR), ACCPM is signatory to the Recommendations for the Conduct, Reporting, Editing, and Publication of Scholarly Work in Medical Journals, issued by the International Committee of Medical Journal Editors (ICMJE Recommendations), and to the Committee on Publication Ethics (COPE) code of conduct for editors. ACCPM follows COPE’s guidelines.